Borough of Poole: We have recently secured planning permission for a rear extension and remodel of a house including roof alterations to form an additional floor which will transform an existing house near Alexandra Park from the existing 3 bed 1200 sqft dwelling into a larger 4-bed 1800 sqft dwelling. Plans were prepared by local architect; Daniel Rainback of Design and Development Associates who tailored the scale, layout and appearance of the scheme to fit with the context of the site whilst achieving the level of floor space set out in the client’s brief. 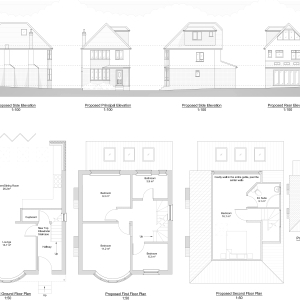 Whilst the resultant property was larger than the existing house on the site, because of constant contact with the appointed planning officer at Borough of Poole we were able to quickly convince the planner that the proposal was acceptable and the application was approved a week ahead of the target date. If you are planning on some home improvements and would like a firm of planning consultants to push your dream home through the planning system then contact us in confidence on 01202 585524 or email us at info@puretownplanning.co.uk for a free, no obligation planning consultation.